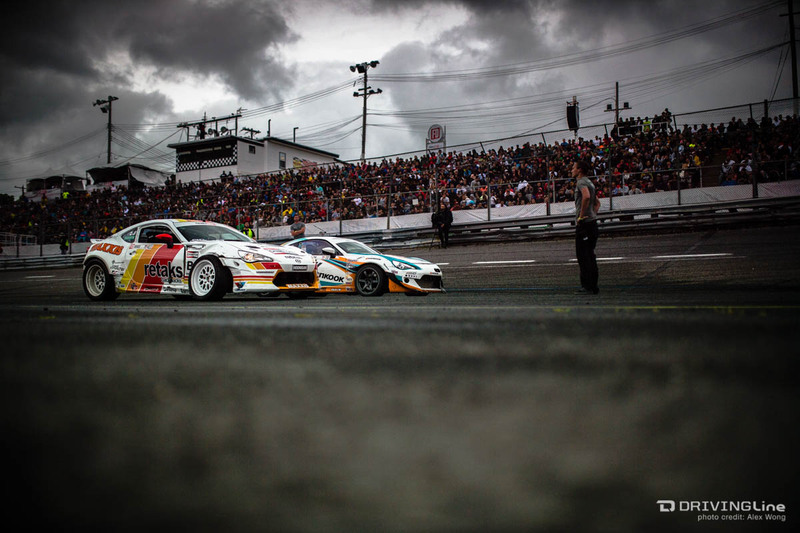 Wall Speedway in New Jersey has become a staple on the Formula Drift schedule, and the 33-degree banking is the most dramatic on the circuit. The uneven guard railing that lines the top of the bank can rip apart a car in a second, but drivers love to test the limits. 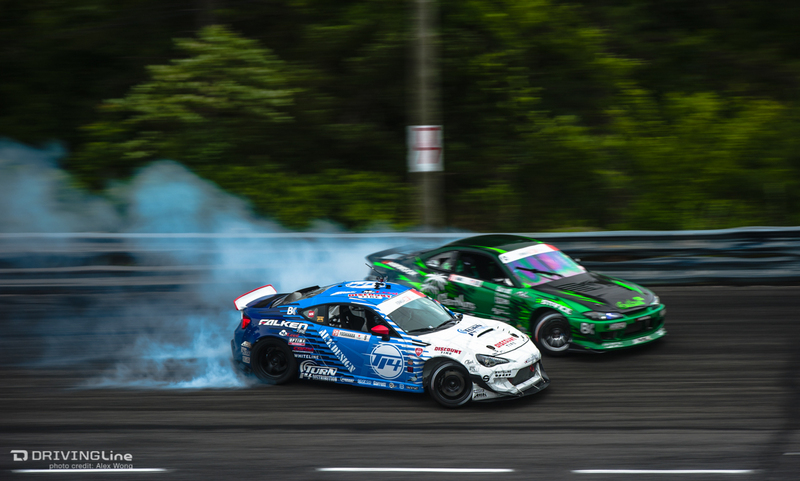 New Jersey marks the middle point of the seven round Formula Drift USA schedule, and many championship chases have been curbed via carnage at the track in years past. The course is a play on a figure eight, and somewhat similar to the Orlando layout just in smaller scale. Drivers take off from the start line and enter the first turn clockwise around the banked track, asked to push their bumpers as close to the guard rail as possible. Before they cross the traditional start finish line, drivers transition off the bank and onto the flat bottom with a switchback before entering the second turn also in clockwise orientation. After pushing their car as far outside on the flat apron without putting a tire onto the bank, drivers switchback once again on the backside of the track before rounding out the track on the apron of the first turn. With three outside clipping zones and a pair of switchbacks, the small track is easily viewed from anywhere in the stands and tends to provide close tandem. In qualifying, Ken Gushi topped the qualifying charts for the second consecutive event with a score of 93, while his Scion Racing teammate Fredric Aasbo earned the same qualifying score but lost the tiebreaker due to a lower style score. 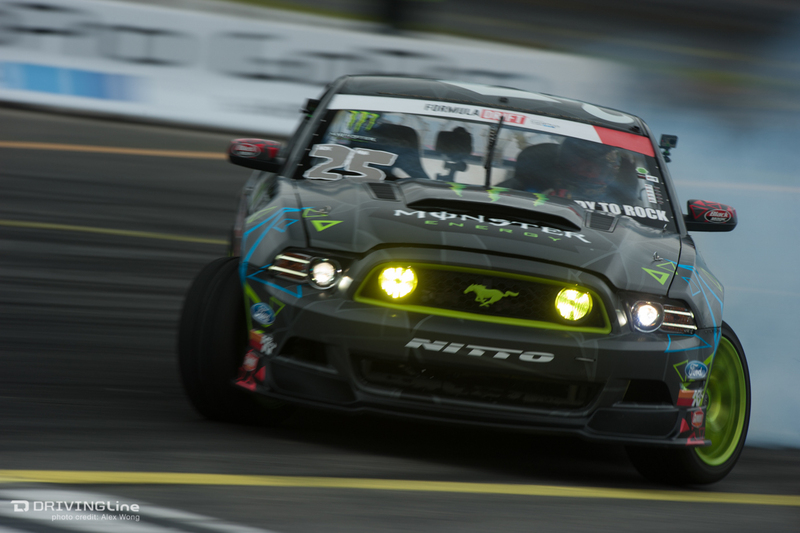 Justin Pawlak pushed his Ford Mustang into the third place qualifying position, with Pat Goodin and Kenny Moen rounding out the top 5. In case you missed the event or the live Formula Drift Driftstream, here’s a play-by-play of how the top 32 tandem battles shook out. Fast forward to the Ford Top 16 or Nitto Final 4. Gushi Lead: Gushi initiating as the number one qualifier for the second straight event, Hamilton isn’t giving him any room! Gushi is high on the bank, just like in his qualifying run, but Hamilton keeps it close through the entire course. A small steering bobble from Gushi, exiting the second outer zone, but otherwise a smooth run for both drivers. Hamilton Lead: Hamilton not as high on the bank as Gushi on Gushi’s lead run, Hamilton taps the outside clip on the apron of the second turn. Gushi closes the gap over the course of the run, Overall not a bad run for either driver. One judge votes for a “One More Time” (OMT), but Gushi wins over the other two judges to win the battle. Field Lead: Field has been pouring out smoke all weekend, this run is no different! Grunewald kept about two car lengths behind Field for most of the course, Field has good usage of the course, Grunewald isn’t far behind despite the smoke cloud. Possibly a slight advantage to Field, but nothing that Grunewald can’t overcome on his lead. Grunewald Lead: Grunewald has a very quick and snappy initiation, Field is close behind through the bank. Grunewald has a good run through the bank and the second outer zone, but as he exits the second turn, Grunewald turns on more angle and over-rotates. Field earns the votes from all three judges to take the unanimous win. Nishida Lead: For the second time this year, the Achilles Tire factory drivers are facing each other in the top 32. Nishida has a good lead run high on the bank, Saito closes the gap towards the end. Nishida has good smooth transitions, Saito has a steering bobble in the second outer zone, Nishida finishes smoothly. Have to think there’s a slight advantage to Nishida. Saito Lead: Saito has a good initiation, Nishida gives some space through the bank. Nishida’s car looks to be smoking before initiation, not sure if that is from lingering tire smoke or actual engine smoke. Nishida surges forward after the switchback on the bank to close the proximity, but attacks too hard and over-rotates. Saito finishes the run smoothly and earns the votes from all three judges. 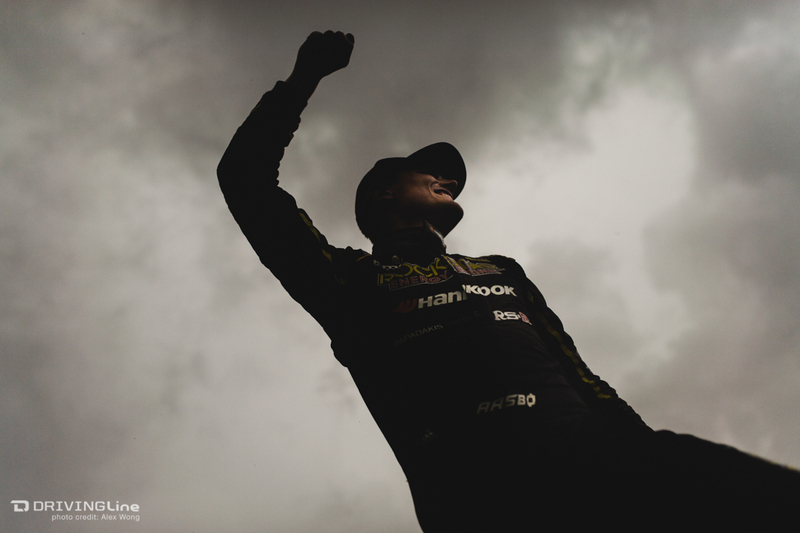 Saito gets the win…. But wait! The announcers mention that Saito dropped down from his lane and into Nishida’s lane after the start. This requires a re-run, this run will not count. Saito Lead re-run: Saito has a huge gap on entry, Nishida’s car looks to have bogged down on the launch. Nishida surges ahead after the inner bank, but too hard and taps Saito. Saito keeps drift and finishes the run cleanly, Saito earns the winning votes from all three judges and will move on to the next round again. Tuerck Lead: Tuerck’s car gets up on three wheels on initiation, the hardest initiation we’ve seen! Wicknick attacks hard entering the second outer zone and closes the proximity, but has an awkward line through the exit of the second outside zone and through the second switchback. Tuerck has a snappy transition, Wicknick surges hard but hits Tuerck. Tuerck needs a tow off the course, fault appears to be on Wicknick, which will likely lead to a win for Tuerck. 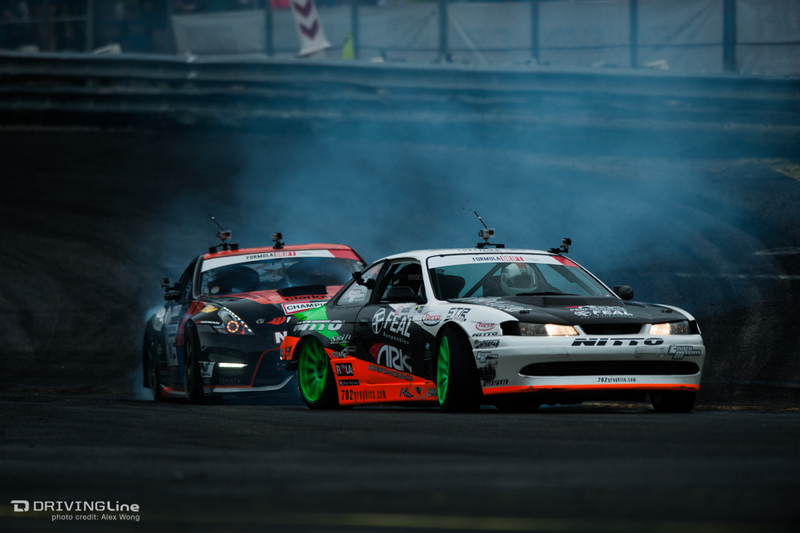 This would be the second round in a row where Tuerck wins his top 32 battle due to contact. Wicknick calls 5 minutes to repair his car. Tuerck’s car had a bent shock and a bent wheel, but both drivers are able to get their cars back together. Wicknick Lead: Wicknick’s car has returned sans-bumper and has a good lead run, no major corrections. Tuerck keeps the gap close through the course with no major corrections. With Wicknick on a 0 from causing contact, Tuerck doesn’t make enough of a mistake to push the run to a OMT. Tuerck earns the unanimous decision. Goodin Lead: Goodin is looking to make up for his failure to qualify at his home track in Orlando. Goodin has a good initiation and stays high on the bank, Essa is definitely lower on the bank with less angle. Essa closes the gap towards Goodin but loses angle in the process. Goodin finishes strong, Essa has a few corrections. Essa Lead: Essa is higher on his initiation as the lead car, Goodin is close behind. Essa has a steering correction mid-bank, Goodin seems much more consistent in his steering angle but not as close in proximity. Essa continues with some steering corrections on the second switchback, Goodin closes the gap again and earns the unanimous win. Wang Lead: Wang is the first driver we’ve seen using a feint entry, Yoshihara leaves some room for Wang but that was likely planned. Yoshihara is close on proximity after exiting the bank, Wang transitions through the switchback and into the second outside zone smoothly. Yoshihara has a steering correction midway through the second outside zone, Wang’s lead run is very smooth with no notable mistakes. Yoshihara Lead: Yoshihara uses the feint initiation as well on his lead, Wang has good proximity through the course. Yoshihara is fairly wide off the mid-bank switchback clip. Wang stays consistent, Yoshihara’s line could be improved. 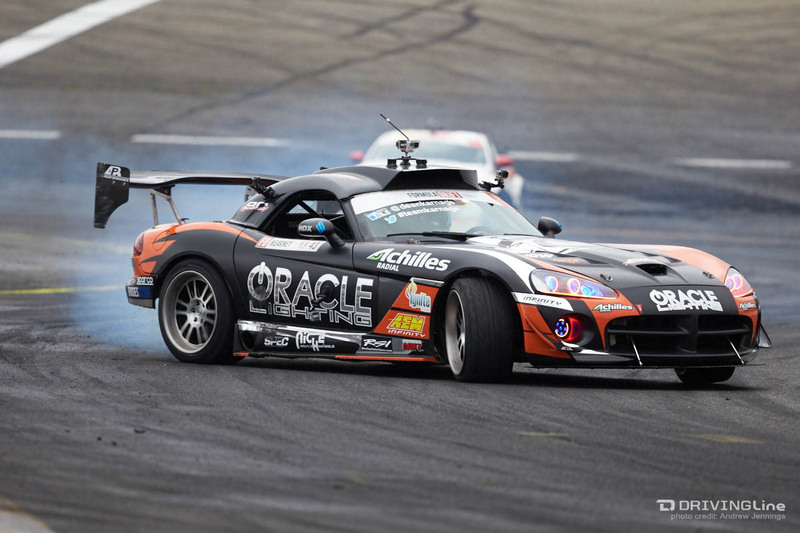 Wang earns the win, knocking out the 2011 Formula Drift champion. Moen Lead: Moen seems to be slow out of the gate, but initiates almost next to the guard rail which doesn’t seem possible. Mohan stays close on Moen through the course, transitioning almost in unison across the mid-bank switchback and back into the second outside zone. Moen’s car is just inches from each clipping point and truly uses every inch of the course. Mohan has a steering correction through the third outside zone, slight advantage to Moen only due to Mohan’s small mistake. Mohan Lead: Mohan isn’t as high on the bank as Moen was on his lead, Moen is extremely close through the entire bank! Moen leaves room for Mohan to transition, then closes the gap again through the second outside zone. Moen is known for being aggressive in tandem, but this looks to be the strongest that Moen has driven so far this season. Moen gets the win and will move on. Gittin Jr. Lead: Gittin lines up a bit ahead of Kearney and has a big gap through the bank. Kearney slowly closes the gap through the second outside zone. Kearney surges ahead at the second switchback, taking out the clipping point, but closing the gap to less than a car length through the final outside clipping zone. Kearney Lead: Kearney has a good run, not as high on the bank as Gittin but a consistent clean run. Gittin is a few car lengths behind through both the first outside zone on the bank and the second outside zone through the apron. Gittin surges ahead at the second clipping point similar to Kearney, but Gittin over-rotates and loses drift. Kearney continues on smoothly, Gittin drops two tires trying to get back in line behind Kearney and finishes the course. Kearney gets the win. Aasbo Lead: Aasbo has a good initiation, but the run is flagged before the exit of the bank due to Aasbo crossing over the line on the front straightaway. On the re-run, Aasbo has a good strong lead run with plenty of angle. Aasbo has more angle through all three outside zones, while Baribeau has a lower line on the bank and shallower angle through the second zone and only makes up a small amount of proximity. Baribeau taps the clipping point marking the end of the second outside zone, likely an advantage given to Aasbo. Baribeau Lead: Baribeau gets aggressive, pushing the higher line on his lead run. Baribeau’s lack of rear bumper allows him to get super close to the guard rail! Aasbo dives in on the first bank switchback and closes the proximity, Baribeau drops a tire on the upper bank through both the second outside zone and again in the third outside zone. Dropping a single tire on the bank in the second or third outside zone is a deduction, dropping two tires on the bank would be a zero. Not sure that it matters as Aasbo had the better run both in lead and chase, judges vote unanimously for Aasbo. Castro Lead: A battle of international champions. Castro has a good lead, Bluss has become quite an aggressive chase driver, but gets too aggressive entering the third outside zone and hits Castro. Fault is given to Bluss. Initial inspection looks clear but Castro’s team wants to take a closer look at the car before continuing. Slight delay while the team inspects the car in the pits. Bluss Lead: Bluss is on a big disadvantage and definitely lays it all out on the line. Bluss’s lead run almost looks like a top qualifying run! Very high on the bank, scraping the bumper on the guard rail, snappy transition in front of the crowd and tons of steering angle and tire smoke all over the track! Castro is flirting with an inactive chase due to being several car lengths back behind Bluss through most of the course but closes the gap in the final outside zone. Judges vote unanimously for Castro as Bluss’s contact was too much to overcome. Had Castro not closed the gap towards the end, we may have been going to a OMT battle. Denofa Lead: Denofa has always been aggressive at Wall, which has caused him to wreck on more than one occasion in the past. Denofa is again high on the bank, flirting with the top guard rail. Stoneback slowly closes the gap, Denofa drops a tire onto the big bank at the exit of outside zone two. Stoneback keeps enough space to allow for Denofa to navigate his line. Not a great lead from Denofa, but not a bad chase from Stoneback. Stoneback Lead: Stoneback is high on the bank, Denofa runs a middle line and shallow angle. Stoneback nudged the clipping points at the start and end of the outside zone, but both sit back in place. Denofa again drops a tire on the big bank midway through outside zone two, Stoneback punts the second switchback clip off course. Judges see mistakes from both drivers and want to see a OMT battle. Denofa Lead: Denofa’s angle and line are far superior to Stoneback, especially through the entirety of the second outside zone. Stoneback was tip-toeing the inside line in an outside zone, while Denofa is full lock and tracing the outside zone. Stoneback closes the gap by the final corner, but likely an advantage for Denofa. Stoneback Lead: Stoneback has a good run on his lead, but Denofa stays close and keeps the pressure on Stoneback. A small steering correction for Stoneback in the second outside zone may be the small mistake that Denofa needs to earn the win, Denofa’s run isn’t overly aggressive but gets the job done. Denofa earns the unanimous win from the judges. Mordaunt Lead: Mordaunt has looked very comfortable in this 350Z compared to his last few competition cars, but he may be a dark horse to do well in this event. Mordaunt has a good initiation and line on the big bank, Landreville over-rotates on the switchback in front of the crowd. Mordaunt finishes the run without any mistakes while Landreville’s car sits on the start/finish line and needs a tow off course. There was a slight sprinkle before this run, perhaps the moisture contributed to the spin. Landreville is unable to fix his car in time, Mordaunt earns the win. 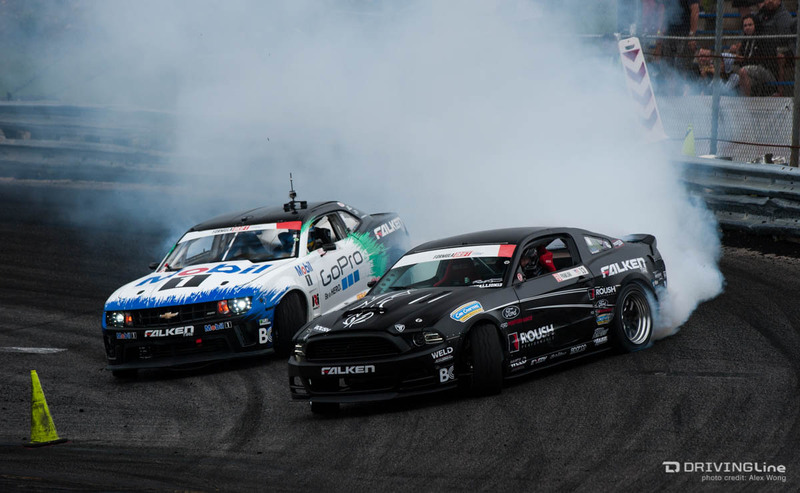 Pawlak Lead: Ford vs Chevy battle, great run from both drivers! Pawlak has a good lead with plenty of angle and smoke. McQuarrie closes the gap and stays close especially through the final outside zone. Pawlak kept the higher line on the bank and the outside line through the proper outside zones, but McQuarrie can’t be faulted for his chase. McQuarrie Lead: Despite the moisture in the air, both of these cars are billowing smoke. McQuarrie has shallow angle coming through the switchback in front of the judges, Pawlak gets aggressive in his chase and is only inches from McQuarrie through the second and third outside zones! Definitely a stronger chase run from Pawlak compared to when McQuarrie was in the chase position. One judge votes for a “One more Time”, but the other two vote for Pawlak. Savage Lead: Savage with an aggressive flick into the bank, but Yokoi is just inches from Savage’s door through the bank! Yokoi leaves just enough room for Savage to transition, then jumps right back on Savage’s door through the second outer zone. Savage runs a little wide entering the third outside zone and may have dropped a tire on the bank, Yokoi loses proximity in the same area. Likely an advantage for Yokoi due to his aggression in chase. Yokoi Lead: Yokoi runs his line, Savage has moments of brilliance but also some mistakes. Savage has steering angle corrections both entering outside zone two and outside zone three, losing proximity with each mistake. Yokoi finishes his run flawlessly and earns the unanimous win. Savage may not have been able to overcome the Yokoi chase run even with a mistake-free run, but the mistakes made the decision easy. Forsberg Lead: Forsberg has a good lead run, Hohnadell closes the proximity through portions of outside zone two and outside zone three. Hohnadell has showed improvement in his chase runs and consistency this season, but Forsberg’s lead is strong and hard to find fault in. Hohnadell Lead: Hohnadell is looking like a seasoned competitor in his lead run. Hohnadell has a surge of speed through the switchback on the bank, Forsberg closes the gap entering the second outside zone. Forsberg looks to be headed off course, but Hohnadell takes out the clipping point marking the start of the second outside zone first before Forsberg gets there. Hohnadell dumps some big angle exiting outside zone two, but Forsberg maintains good proximity and gets even closer through the final outside zone. A great lead run by Hohnadell, but a calculated and precise chase run from Forsberg. Forsberg earns the unanimous win. Bakchis Lead: Bakchis gets a quick jump on his lead, Jones looks to be having mechanical issues. Jones cruises through the big bank at a slow speed and not in drift, while Bakchis runs a smooth lead run with plenty of angle and smoke. Jones stops on track and needs a tow. Jones Lead: Jones retires, Bakchis gets the win. Overall, the start time for the top 16 has been moved up over an hour to try and get the tandem battles in before a big storm that is scheduled to hit later in the evening. Top 16 intros occur under a mix of overcast skies, clearing showers and 20 mph wind gusts. Several young men and women take a pledge to enter the Air Force prior to the national anthem, and the remaining 16 drivers are introduced before doing some donuts and exiting the track in preparation for the top 16 runs. The track is definitely still wet from the showers that happened during halftime, it will be interesting to see what happens during tandem. Gushi Lead: Speeds are definitely lower than in the previous round due to the wet pavement. Gushi enters and stays high on the bank and taps the guard rail mid-bank which requires a slight correction from Gushi. Field closes the gap too quickly and spins to avoid making contact. Gushi finishes the run cleanly, Field will be at a major disadvantage for the second run. Field Lead: Field is able to maintain drift through the bank, Gushi runs a slightly lower line and wisely leaves a bit of room between him and Field. Field keeps drift through the second outer clipping zone, but spins midway through the third outside zone. Gushi gets the unanimous win after a pair of spins from Field. Tuerck Lead: Tuerck also uses a slightly lower line through the entry and first portion of the bank, but pushes out to the guard rail towards the end. Saito takes a middle line and drops off the bank earlier than the judges would prefer, but Saito keeps good proximity through the second outside zone. Saito leaves room for Tuerck to transition, then sticks within inches of Tuerck in chase around the third outside zone! Although the speeds are much slower, the car control from Saito to maintain drift while sticking within inches of Tuerck is incredible to watch! Saito Lead: Steering corrections become much more pronounced in these partial wet conditions. Saito’s lead run has a few small corrections, Tuerck isn’t able to close up the proximity until midway through the second outside zone but loses the proximity through the second switchback and doesn’t close it until the final turn of the third outside zone. Tuerck had a stronger lead run, but Saito’s chase was much better. Tough run to call, one judge votes for Saito while the other two vote for a OMT battle. Tuerck Lead: Tuerck goes full bore into the bank, looks like the bank is drying out quickly. Tuerck transitions late on the switchback and looks to be slowing substantially for the second outside zone when Saito miscalculates the distance and hits Tuerck. Fault to Saito for the contact, seems like Tuerck is drawing contact in nearly every tandem run he makes this year. 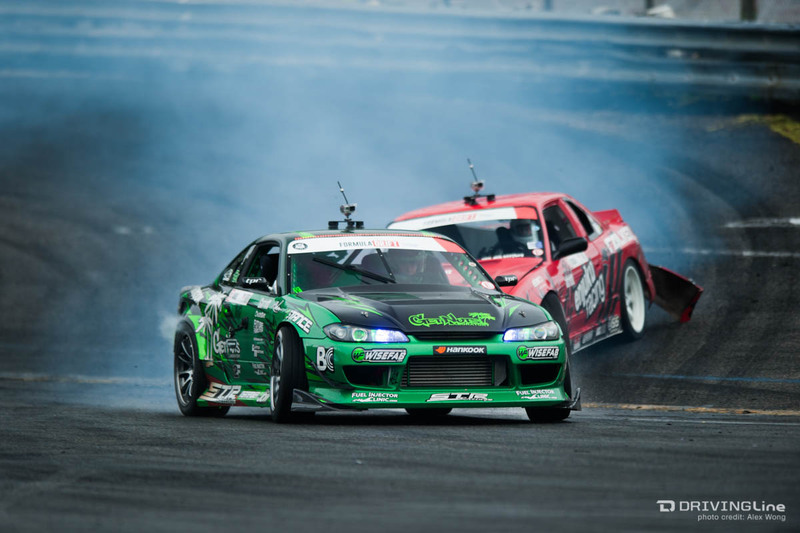 Saito Lead: Saito runs the bank smoothly and transitions in front of the crowd with Tuerck closely behind. Saito's rear wheels creep up on the bank in the outer zone, which is a deduction, and slows substantially. Tuerck is able to maintain drift and match the speed nicely, Saito has another steering correction on the second switchback which Tuerck adapts to as well. Tuerck gets the unanimous decision, mostly due to Saito's contact on the initial run. Goodin Lead: Goodin is pushing the upper limits of the wall towards the end of the bank, Wang has a small gap but slowly closes it. We are starting to see some smoke on the bank, but the aprons both appear to be quite wet. Wang doesn’t make any mistakes, but isn’t overly aggressive either. Goodin spins midway through the final outside zone, Wang is able to safely avoid contact. Big advantage to Wang. Wang Lead: Wang has a conservative entry and dumps a ton of angle towards the end of the bank, Goodin closes the gap exiting the bank but spins through the switchback in front of the crowd. Wang only needs to maintain drift to continue into the Top 8 and is able to do so. Wang gets the win. Moen Lead: These drivers are very familiar with each other as they have driven against each other in Europe for years. Moen initiates high on the bank and has a steering correction mid-bank which pushes him high and into the guard rail. Moen’s car straightens out after the guard rail tap, Moen tries to push through the tap but loses drift as he comes onto the apron and shuts it down. Kearney will have a major advantage going into the second run. Kearney Lead: Kearney isn’t as high on the bank as we’ve seen, but doesn’t need to score a perfect run to get the win. Kearney is probably one of the more experienced drivers in these kind of conditions. Moen gets aggressive in his chase, trying to force a mistake, but Kearney keeps his head on straight and finishes the course flawlessly. Moen’s line through the second switchback is a little awkward, and Moen loses proximity around the final turn. Kearney gets the unanimous win. Aasbo Lead: Aasbo is high on the bank with plenty of smoke, but the flagger is waiving for a red flag due to Aasbo crossing over the yellow line on initiation. We re-start the run, Aasbo looks good through the bank but Castro is driving straight through most of the bank. It looks like Castro forgot to initiate. Aasbo has a steering correction after the switchback in front of the crowd, but nowhere near as big of a mistake as what Castro had. Aasbo finishes smoothly, Castro never makes up any proximity, major advantage to Aasbo. Castro Lead: Castro gets through the bank smoothly, but spins out shortly after entering the second outside zone. Aasbo takes a quick detour back on the bank to get around Castro then finishes the course smoothly. Aasbo earns the win due to a pair of zeros from Castro. Denofa Lead: Denofa is always aggressive with his entry, and this run would be no different. Mordaunt exits the bank a bit early, but leaves space for Denofa to transition. Mordaunt’s line isn’t what the judges want to see and he spins entering the second outside zone. Denofa might have put a tire on the bank near the end of outside zone two, but keeps drift through the entire course and will take a major advantage into the second run. Mordaunt Lead: Mordaunt’s line is a bit lower on the bank, but he pushes the distance between the cars through the entirety of the course. Mordaunt’s car clearly is finding grip in places that other drivers haven’t seen yet. There’s discussion about whether this is an inactive chase from Denofa, but judges vote unanimously for Denofa. Pawlak Lead: Pawlak’s car is one of the loudest on the grid! Pawlak has a big entry and pushes some pretty good tire smoke through the bank. Pawlak over-rotates transitioning from the switchback into outer clip two and will be at a major disadvantage entering the second run. Yokoi Lead: Yokoi has a clear E-brake entry into the bank, Pawlak has much more speed exiting the bank and touches tires with Yokoi. Both drivers try to continue on, but there's major damage to Pawlak's front wheel and he pulls off course. Pawlak is at fault for the contact, Yokoi earns his way into the top 8. Forsberg Lead: Forsberg has never lost to Bakchis in four previous battles, but Bakchis is the current leader in the points. This run will have major implications for the championship! Bakchis is pretty tight on Forsberg through the bank and the switchback, but Forsberg over-rotates in front of the crowd. Forsberg gets back on the throttle and finishes the course, Bakchis spins midway through the second outside zone, but the run is over at the point where the lead car zeroes out. Bakchis Lead: Bakchis is smooth through the bank and the switchback, Forsberg spins while chasing Bakchis in almost the same spot as on his lead run. Bakchis finishes the run flawlessly and earns the win. This is the first time in memory that Forsberg has spun twice in a tandem battle, this may end his championship defense pending the outcome of the event. Gushi Lead: Gushi initiates into the bank but has to re-initiate midway through the bank. Tuerck leaves some room, Gushi slides back onto the bank in the second outside zone (which is a deduction), Tuerck has to slow to avoid hitting Gushi. Gushi finishes the run smoothly, advantage is likely to be with Tuerck. Tuerck lead: Gushi gets aggressive on his chase, Tuerck handles the pressure calmly. 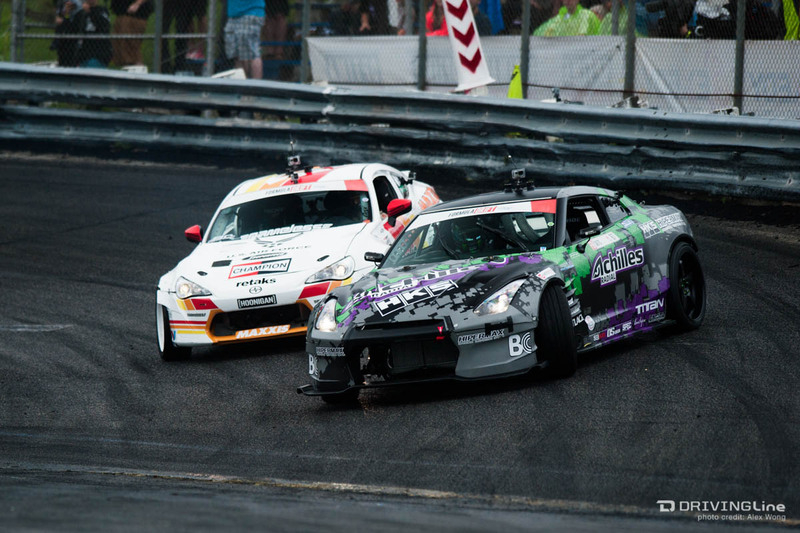 As both cars transition through the first switchback and the second outside zone, Gushi gets awkwardly close to Tuerck. There’s even some flex on Tuerck’s bumper from Gushi grazing it. Tuerck continues through the course and Gushi taps Tuerck not once but twice through the final outside zone. Tuerck gets the unanimous win due to Gushi making contact twice on the run as well as the major mistake on the first run. Wang Lead: Wang has a good line through the bank, Kearney slowly closes the gap as they cross the switchback. Wang starts to pull some tire smoke in the later half of the second outside zone, a place where no other driver has seen tire smoke yet. Kearney Lead: Forrest gets aggressive and taps Kearney while exiting the second outside zone. Kearney is unable to make his transition, Wang is determined to be at fault for the contact. Kearney gets the unanimous win. Aasbo Lead: Aasbo is still running one of the highest lines on the bank, Denofa takes a lower line to keep the proximity close but loses ground after the switchback. Aasbo keeps consistent line and angle through the run, Denofa gains proximity again through outside zone two but loses proximity and angle again entering outside zone three. Several corrections from Denofa likely puts him at a disadvantage for the second run. Denofa Lead: Denofa shows some big angle while exiting the bank, his lead runs have been much better than his chase runs. Denofa runs a much better line and plenty of steering angle through the course, Aasbo closes the gap entering the second outside zone but leaves some room through the rest of the course. There’s definitely a bigger gap than judges would prefer, but far from what can be deemed an inactive chase. Aasbo earns the unanimous decision. Bakchis Lead: This is a rematch from the Top 16 in Orlando when Bakchis spun in semi-wet conditions. Bakchis keeps it together and maintains drift through the entire course. Yokoi dives in aggressively entering the switchback and taps Bakchis with his front bumper, Bakchis is unaffected. The contact is definitely due to Yokoi being over-aggressive, but since Bakchis didn’t waiver, he might actually be rewarded for being so close. Yokoi Lead: Yokoi’s dragging his front bumper through the entire run as the mounting tabs must have been damaged from the contact. Yokoi has a good run, Bakchis dives in towards the end of outside zone two and closes the proximity, then stays close through nearly the entire outside zone three. Bakchis’s chase run was very strong, this may come down to how the judges view the contact from Yokoi. One judge votes for a OMT, Yokoi earns one vote and Bakchis earns a vote. A split decision will lead to a OMT run. Bakchis Lead: Bakchis enters the bank, Yokoi sits back through the bank and dives in hard after the switchback, keeping the proximity right at one car through the majority of the second outside zone. Bakchis’s line is a bit conservative, but given that we’ve seen several drivers earn deductions for dropping a tire on the outside bank, we don’t blame him for running that line. Yokoi leaves room for Bakchis to transition exiting the second outside zone and through the second switchback, then closes the gap again through the third outer zone. Perhaps a slight advantage to Yokoi. Yokoi Lead: Yokoi runs his line, Bakchis has almost identical moments of proximity through the run. Yokoi is clearly one of the smoothest drivers, he has substantially fewer steering corrections even in the wet than the other remaining drivers. Bakchis’s proximity appears to be closer around outside zone three than when Yokoi was chasing. Judges vote unanimously for Yokoi. One of the judges explains over the loudspeaker that Bakchis wasn’t filling the outside zones as well as Yokoi was on his lead run, and with proximity in chase being similar, the line of each driver’s lead run because a major point of judging. Tuerck Lead: Kearney has yet to defeat Tuerck in four previous match-ups. Tuerck keeps the same high line he has run all day long, Kearney dives in after the switchback to tuck in tight on Tuerck and maintains close proximity through most of the second outside zone. Tuerck pulls away momentarily before the third switchback, then Kearney dives aggressively again in the final outside zone. Kearney Lead: Kearney starts the bank with a three car lead on Tuerck, which Tuerck closes up by the exit of the bank. Tuerck gets too close to Kearney before they can transition off the bank and spins out. Kearney finishes the run, replays show that Tuerck just got too aggressive on the bank and didn’t give Kearney room to make his transition. Judges vote unanimously for Kearney. Rain has started to fall before the battle, and officials have given each driver a chance to feel out the levels of traction before making a pass. Aasbo Lead: These two drivers have battled many times in both FD Japan and also in the US, and have always had heated battles. Speeds are down substantially, but the level of driving is still extremely high. Aasbo has a correction on the switchback in front of the crowd, but Yokoi has a similar correction due to a slow transition after the second switchback. Yokoi Lead: The run feels like it’s in slow motion, but the level of driving is insane. 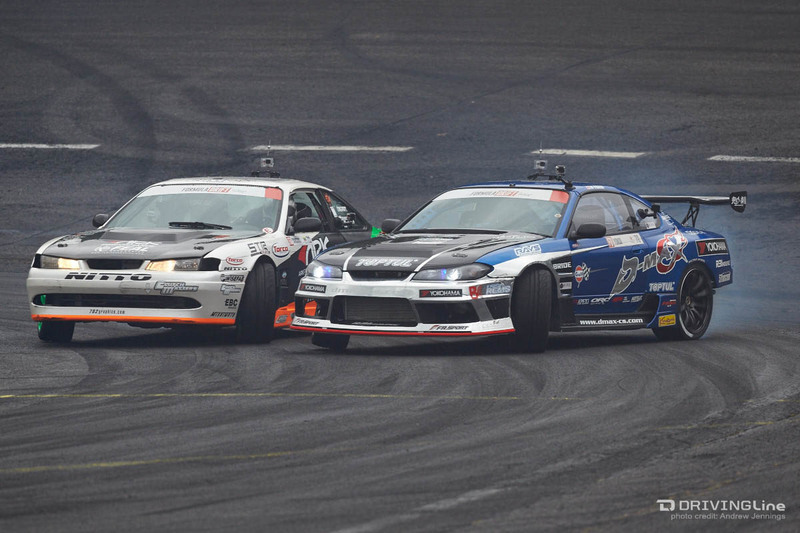 Aasbo keeps good proximity through both outside zones, Yokoi doesn’t make any major mistakes. Tough to make a decision, but Aasbo’s chase looked to be closer and more consistent against Yokoi’s. Judges vote unanimously for Aasbo. Because Ryan Tuerck qualified higher than Masashi Yokoi, Tuerck will earn his second consecutive podium and third of the season. These drivers are also quite familiar with each other after years of battle in Europe before both drivers debuted in Formula D back in 2010. Aasbo earned Rookie of the Year honors that year, while Kearney has been battling to climb the standings ever since. This should be a great battle! Both drivers are given a practice run as the conditions are substantially wetter than even the last run. Aasbo Lead: Aasbo has a smooth line and gets out to the outside zone in both zones two and three. Kearney has a steering correction coming across the switchback in front of the stands, but otherwise has good proximity through the course. Kearney Lead: Kearney doesn’t make any mistakes, but is a bit shallower on his line compared to Aasbo’s lead. Aasbo has good proximity, especially given the conditions. Judges have found a winner. Drivers are brought out in front of the crowd, Kearney is announced in second place, which means Aasbo has won for the second time this season!